Please note that this might not be the latest issue of the Parish Newsletter. For a full listing and to find the latest issue click here. Here is the text from the March 2017 Newsletter Published here with permission of the Parish Council. * The Neighbourhood Plan is gaining momentum, thank you to Les and Wendy for taking this up and pushing it on. If we are to have a greater say in what goes on in our village and parish, we need this plan so please come along to the workshop on 22nd April (see next item). * Plans for events over the summer, autumn and into next year are being identified and highlighted in later sections of the newsletter. Please support them. Thank you to all those how are working both openly and behind the scenes to bring these to fruition. * Since I last wrote the road markings on the roundabout by the church have been painted on…..and have worn off. We have reported this to Highways, but it would appear that “Fixmystreet” is a better way of pressuring the authorities to repair the roads than old fashioned communication. Given the state of the roads in Oxfordshire we should all be on “Fixmystreet” everyday! * As we prepare for the future expansion of Brize Norton that will be coming our way in the not too distant future your council has been looking at ways of better defining the policies and procedures by which we can transparently discharge our duties. Once agreed these will be published on the parish council website. We hope to have this in place before the Annual Village Meeting on 23 May 2017. Please join us for this meeting, it is one of the ways where you can provide direct feedback (good and bad) to the Parish Councillors on village life. * We are still awaiting the legal agreements for the West Brize Norton development. It would appear that external forces are causing delays. You will no doubt have seen in the press and from letter drops through your doors that Oxfordshire County Council (OCC) are pushing hard for a single Unitary Authority to provide Local Government Services. This is in response to continued Westminster pressure to save costs. After careful consideration, we, like WODC, are against a single unitary authority, it will give too much power to Oxford City at the expense of the rural districts like ours. Unitary authorities have been successful in other parts of the country, but only where there has been less of a contrast between urban and country life. We are still waiting for WODC to publish their counter proposal. In the meantime, I would urge you to resist any OCC proposals – WODC would like you to make your views known at www.westoxon.gov.uk/at-risk and if you would like further information please feel free to contact me, or any of the other Parish Councillors. In the meantime, although it is still February the mild weather today and the spring flowers in the garden suggest that spring could be around the corner. Enjoy the rest of the newsletter and thank you to all the contributors, editors and distributors. Since the last newsletter, Brize Norton Parish Council has formed an independent steering group of Brize Norton residents. They have been working on ideas for a Neighbourhood Plan for Brize Norton and would like to consult with the community to discuss the issues and aspirations that the plan should cover. They are inviting you to drop in at any time to the Elderbank Hall on Saturday 22 April between 1pm until 7pm so they can discuss with you why now is a good time to bring the community together and plan for the long-term future of our village. Community engagement is key to the development of a Neighbourhood Plan so they would like to take this opportunity to explain what the proposed plan consists of and how it will benefit Brize Norton. There may be additional topics that have not been considered but that you think should be included. The event is open to everyone, both young and old and refreshments will be provided. The Brize Norton Parish Council Team have been working on the Parish website and we would like to receive your comments, ideas and notification of village events to be included on the Calendar. Go to:- http://brizenortonparishcouncil.co.uk and click on CONTACT US tab. We are looking forward to 2018 and the 100th Anniversary of the end of The Great War. In planning for events for 2018, as a starter we have put our village forward to light a beacon on November 11th 2018 and it would be good to involve various organisations in the village on this day, so ideas would be welcomed. Another idea could be a village New Year’s Eve party at the end of 2017 into 2018. At the moment I am looking for ideas and people who would like to put the ideas into practice. In the first instance send me an email or call with ideas and offers of help at tonyshillingford@yahoo.co.uk or 01993 847009. Thank you to everyone who took part in our Christmas services especially the Candlelit Carol Service either as readers or the children in the nativity tableau. Thank you also to the residents of The Fosseway, Squire’s Close and Daubigny Mead who joined us in carol singing. With the new church financial year our attention turns again to the ongoing problem of paying our way. Now that the major works are behind us we are focusing on ongoing maintenance and running of the church. It costs £400 per week for the basic running of the church, this is before the cost of any maintenance required. Regular weekly collections are only on average 1/3rd of this cost. The church is not there only for weekly services and special occasions but to serve the wider village community for baptisms, weddings, blessings, funerals and memorial thanksgiving services. It is also used by the school for Christmas, Harvest and Remembrance. We continue to maintain a presence through the community website at www.bncommunity.org which has a good deal of church and village history and genealogical information. St Britius Church receives no subsidies from the Government or monetary grants from the local Councils although we are indebted to the Parish Council for their continuing assistance for the grass cutting of the churchyards. We are trying to raise monies through various initiatives and would welcome your support to keep St Britius a visible and permanent sign of the Christian community in the village. 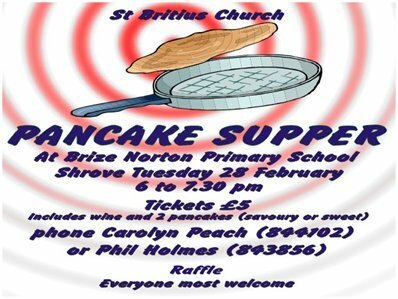 Fundraising we have planned is a pancake supper evening on Shrove Tuesday, 28 February, 6pm to 7.30pm, £5 per ticket for two pancakes (sweet and/or savoury) and a glass of wine/soft drink – see advertisement for further details. We are grateful to the headmistress for letting us use the facilities of the school hall. During Lent we are also repeating the ‘Smartie Tube’ fundraiser. Please take a tube of Smarties (on the table inside the church), eat the contents (or store them in another container until Easter Day) and then fill the tube with coins - 20p and £1 coins fit well - donating money saved from your Lenten abstinence. Return the tube to us at Easter. Thank you to everyone who has renewed their membership of the Friends and supported us over the last year. If you are not already a member please consider joining – we ask for a minimum donation of £10 and you will receive a newsletter to keep you up to date with our future projects. For more details of all fundraisers please contact Phil - 843856 or Carolyn - 844102. Our Mothering Sunday Service is on Sunday 26th March and everyone is welcome. Children are invited to come to 52a Station Road on Saturday 25th March at 3pm to make posies that will then be presented at the 9.15am service. Easter Day – 16th April – Holy Communion at 9.15 am. Alongside the Pilgrim discussion group each Monday lunchtime 12.30pm to 1.30pm (soup lunch provided) we are running a Lent Course ‘Fleeting Shadows’ at Church Farm House, Wednesday evenings 1st, 8th, 15th, 22nd, 29th March and 5th April at 7.30pm. All are welcome. Robert Courts MP to worship with us. There will also be an opportunity over coffee and refreshments to meet and chat with him after the service. The first Sunday in the month is our Family Communion service starting at 10am when activities are arranged for children attending and refreshments are served. On the remaining Sundays the 9.15am Holy Communion service is held and during the week a Holy Communion service at 7pm on Wednesdays. For further details of the church services or our other regular activities, Forest Church and ‘My Time’ refer to the notices on the church door or log onto the website www.bncommunity.org. Our vicar Rev Maddern can be reached on 01993 844175 or via e-mail vicbrizecarterton@btinternet.com. ELDERBANK HALL COMMITTEE - COULD YOU HELP PLEASE? The Elderbank Hall Committee is looking for a Treasurer to take over in April. The position includes, keeping simple accounts, paying bills and banking, issuing invoices for use of the hall and to attend quarterly meetings. We are also looking for a person to take minutes at our meetings, and to deal with a small amount of correspondence. As always, our little village school has been very busy! All the children are working really hard on their learning, and we are proud of the progress they are making. Special events to mention have been the Christmas plays: two of them, the musical nativity by our Foundation, Year 1 and Year 2 children (entirely sung with sixteen solos), and “Cinderella and Rockefella” by our older children. The Christmas bazaar, whole-school pantomime trip, Christmas dinner and carol service were great fun as always. Thank you to everyone at St Britius’ Church for making us so welcome. Since January, the biggest thing in my life has been returning from maternity leave. My son, Sebastian, is now eight months old and has started at nursery. It’s been lovely to come back to school, get to know the new children and get involved in the hurly-burly of school life again. The school has been very well looked-after in my absence and I am grateful to Paul Atkins, the Acting Head, for all the work he has done. As always, we are grateful for the large number of people from the community who support us, whether by visiting our bazaar, volunteering in school or just being friendly to the children around the village. We are always prepared to welcome more volunteers; if you are interested, please contact the school office. Meanwhile, roll on half term (as I write), and here’s to another successful term at Brize Norton School. Thank you to everyone who came and supported our Christmas Bake Off and Fayre. We have some very talented young cooks who produced a huge selection of delicious Christmas cakes and biscuits which were sold at the Fayre. We raised £757, much of which was spent on coaches which took the whole school to the pantomime in Oxford at the end of term. This year is already off to a busy start. We are hoping to raise £600 to pay for a dance workshop to support the PE and literacy curriculums and inject a bit of fun into proceedings! The fundraising kicks off with a number of events for the children; a disco, the Easter egg raffle, and hopefully a craft morning. We are also running our regular quiz night and pudding competition on Friday 17th March. Doors open at 7pm for a 7:30pm start. For more information or to book your place call Jo on 07554443678. We hope to see you there! It’s that time of the year again, after a few harsh months we are now all looking forward to springtime to be able to be let loose in our gardens again. This year is a particularly exceptional Event for the National Garden Scheme as it is their 90-year anniversary of raising funds for their nominated Cancer Charities. The date to put in your diaries is for Sunday 18th June, starting at 2 pm. We will be staging a Mad Hatter’s Tea Party with Alice and her friends in the Orangery at Barnstable House, along with a display of several wacky Mad Hatter, hand-made, children’s hats and beanies, that can’t be found on the High Street. All of these will be available for you to purchase on the day, with all of the proceeds from this sale going to the NGS Cancer Charities. So please do come along, so that you do not miss out on this once in a year Garden Event. In doing so you will help support all of the Cancer Charities nominated by the NGS. Also, in addition a small percentage of the takings will be evenly distributed amongst our own local village groups that are also in need of your support. I would like to take this opportunity to thank the WI and all of those dedicated garden members who work so hard to make this a successful annual Event. So now we all look forward to another glorious Garden Open Day in June. Furthermore, if any one would like to join us on this special Garden Open Day Event, then please feel free to contact me, Jean Butcher on 01993 841347. The S&SC is in somewhat of a waiting game at the moment, hoping plans for the improvements will come to fruition very shortly! In the meantime we are fixing this and that and looking to insulate the roof space in an attempt to reduce the energy bills! Any thoughts or help would be much appreciated. The Club would like to give a big thank to Richard Clarke, who after some many years (too many to count) has retired from the Treasurers roll. He has done an incredible amount of work in keeping the club on the financial straight and narrow, and all involved with the S&SC pass on our thanks to Richard. He is of course welcome back anytime!!! Judy Puddle has very kindly offered to take up the roll and we all thank her for doing that. If there are any people out there wishing to assist in the running of the S&SC then please do get in touch. You will be very welcome! As we know spring, and therefore summer, is just around the corner. With that in mind the S&SC will be assisting in this year’s Village Bash on the 9th July and even later on in the summer - August 27th - organising a ‘old fashion’ cricket match - which will involve as much drinking and eating the cricket teas as it will playing the game. More news on both events in the next newsletter. Well it’s unlike me to pass up an opportunity to talk about rubbish, so here is my contribution to this edition of the village newsletter. You will probably have heard that the recycling service is changing again. So what does that mean? It means we are moving away from a “kerbside sort” where the boxes are sorted into compartments on the truck at the kerbside, to a co-mingled with separate glass collection. So what does this mean? The “co” stands for commodity (a raw material or product that can be bought or sold, this is according to the OED) so something like glass, plastic, cardboard etc. Mingled means to mix. So, when we all get invited to that social event of the year, we make our excuses to go and “mingle” or to mix with others, therefore co-mingled means a product that can be bought or sold that is mixed with others, so simple a bin-man could understand it! But what does that really mean? Well it means that we don’t have to worry about all those black boxes anymore, that’s one positive. Another positive is we can get more in a bin; one standard wheelie bin is approximately 5 boxes. The list goes on, a box will end up in the your neighbours area on a windy day, a wheelie bin won’t; you won’t come home from work to find a mass of boxes all over your path, a wheelie bin will pretty much stay put where it’s put. Life is also made harder for the urban foxes to get into a wheelie bin, it’s very easy for them to nudge the lid off a box and have a perusal. It will also be harder for the drunken urban foxes to trip over a wheelie bin, (trust me I know). A wheelie bin will last a life time, considering the abuse it gets, and boxes’ have a limited life span. Providing the lid is closed on the bin nothing will fall out. But I won’t be able to sort all my recycling into different boxes now I have a bin. Yep, your right there is now (although I did write 7 years ago and say there was no need to sort everything out into different boxes) no need to sort out anything that is recyclable, this will all be done at the transfer station. So that makes it even easier for the householder (or the kids, if you have any). But I have no space for a bin. If you have space for a box you have space for a bin. But I don’t need a bin as I live on my own. Remember the recycling bin will be emptied every fortnight, so if you had 1 box getting emptied weekly, this equates to 2 boxes plus a box for glass so you will have 3 boxes, so you will need a bin. But what’s the point in having a bin? It will go to landfill wont it? See my previous comments about bins, and no, it won’t go to a landfill site, it will all get recycled, see one of my earlier volumes. You will need to keep one box for glass recycling. I did explain this in the last edition, but don’t worry, I will keep you informed of the changes as they happen. If I can’t help you the Council can, and you can contact them on 01993 861000. Till next time, happy recycling, and don’t let Brize go to waste. The 1st team have continued to struggle, mainly due to availability of players and currently sit in 9th place (out of 11 teams). Unfortunately with 4 games left to play there is every possibility of being relegated to Division 3. The Reserves have had better results and currently sit very respectively in mid-table in Division 4. The Christmas Raffle was very successful with 710 tickets being sold. Thank you to everyone who took part. The Thames Valley Police Non-Emergency number is 101 but always call 999 in an Emergency. We meet in the Elderbank Hall every Thursday evening 7.30pm-9.30pm. We dance ballroom, Latin and sequence dances to CDs. We have tea and biscuits in the interval. Any information - please ring Joy on 01993 842373. With Christmas well behind us we started the New Year with an excellent speaker who told us about the Breweries that existed in Oxford and took us on a tour of the various Victorian and Edwardian Industrial Buildings that were around at that time. The talk was called "Beer, Sausages and Marmalade" and included the butchers and grocers of that time. An excellent talk which had us all wanting to go on a Pub Crawl. This talk goes to show that you cannot always judge what a speaker is going to be like just from the title of the talk! We meet on the 2nd Tuesday of the month in the Elderbank Hall at 7.30pm. It is with regret that the Rainbows unit in Brize Norton has closed due to insufficient numbers. Over the 23 years that I have been running this unit I have had lots of fun and have many fond and happy memories. For this I would like to say a big thank you to all of the girls who attended and to all of the people who helped me to run the Rainbows. Happily, Brownies continues. We meet once a week during term time on a Monday evening in the Elderbank Hall. We play games, cook, do badge work, crafts and much more. We go on outings and sleepovers. This term we are working towards our ‘Seasons’ badge. So far, we have had an Australian BBQ evening (summer), built marshmallow igloos (winter) as well as the girls giving a short presentation on each of the seasons. We have all been to watch the pantomime on the camp, always fun, and we are joining the rest of the District for a camp fire on February 23rd to celebrate Thinking Day. New members are always welcome; if you would like to come for a visit please ring me on 842013 or drop in on a Monday evening. Monday 3rd April at 7pm at the Pavilion. The clerk will be available from 6.30pm to take receipt of rents due. If you are interested in renting a plot please contact the clerk to be added to a short waiting list; Brize Norton parishioners get priority. A very big thank you to all of the businesses who sold poppies and especially to all of those who turned out in the cold to sell poppies door to door. We raised a fantastic £905.24 in the village and the church collection is still to be added to this total. I have been the Poppy Appeal organiser in the village for the last 20 years. Many of the sellers have been with me for much of that time, Mrs Gallop even longer (thank you), and they are now thinking of stepping down. So, we are looking for volunteers to come forward to sell poppies once a year at the end of October. If there are lots of us, then our ‘patches’ will be small - many hands make light work. So, if you would be happy to sell some poppies, perhaps in your street, or part of, then please ring me on 842013. Witney - We meet at Witney’s Windrush Leisure Centre at 10 am on Tuesdays, Thursdays and Saturdays. There is no charge. We do two walks; one is 1-2 miles long, the other 2-3 miles both ending up with a cup of coffee. For more information ring Joy on 01993 842373. Carterton - On Monday, Thursday and Saturday we meet at the Town Hall, Carterton at 10am. The walks are 1–2 miles long. For more information contact Barbara Goudal on 01993 845923. Future events will include Tea by the Canal at Thrupp, cream tea, coffee morning and a Coach trip, probably to Stratford, but the programme hasn’t yet been finalised. We are a village group of 26 members. We meet on the 1st and 3rd Tuesdays on the month with either an outing or a meeting. We meet at 4 Squires Close at 2pm. We enjoy sandwiches and home-made cakes, thanks to June, Connie and Benita. We are entering our 19th year. I have sad news to announce, that Jean Chester, one of our long standing members died on Tuesday 7th Feb. The programme is posted on the hall notice board, or contact Joy on 842373. We meet every Monday at The Elderbank Hall and play from 8.00 pm until 10.00 pm; all ages from teenage to active retired are most welcome. It cost just £2.50 per session. For more details ring Tina on 842268 or Laurence on 07771 998821, or just come along to the hall. West Oxfordshire residents are being warned to guard against bogus callers telling them their council tax bands maybe too high. Several residents have been in touch with the District Council saying callers from the ‘Claims Review Bureau’ have contacted them offering to work on their behalf to obtain a reduction in exchange for a fee of about £80. But staff have emphasised that anyone wanting to appeal against their band can do so for free by contacting the District Valuation Office. Residents wishing to appeal against their council tax banding can do so by contacting the District Valuation Office on 03000 501 501. The District Council also remind residents that staff would never ask for a customer's bank details via email. To report a suspected scam, contact Oxfordshire County Council Trading Standards on 0845 051 0845. Michael your postmaster attends the Sports Pavilion on Tuesdays and Thursdays between 9.30am and 12.30pm. Your village Post Office provides all of the traditional post office services as well as a limited quantity of snacks and groceries too. .
at garry.griffin@tesco.net by 14th May 2017. OCC: Neil Owen, 'Robinswood". Frog Lane, Milton-u-Wychwood, OX7 6JZ. Meetings held in the Pavilion, first Monday every month at 7.30 pm, all welcome to attend.